The next thing to consider, and probably the one that would ultimately determine your choice, is the mattress firmness. We are going to take a closer look at some top rated firm mattresses on the market. They are usually preferred by people who like to sleep on their backs or stomach. For more options, we recommend that you read our highlights of best-rated brands and see the winners for each category. Who Should Sleep on a Firmer Bed? Who Shouldn’t Get a Hard Bed? Of course, that’s far from being enough when it comes to determining the firmness level of your bed. 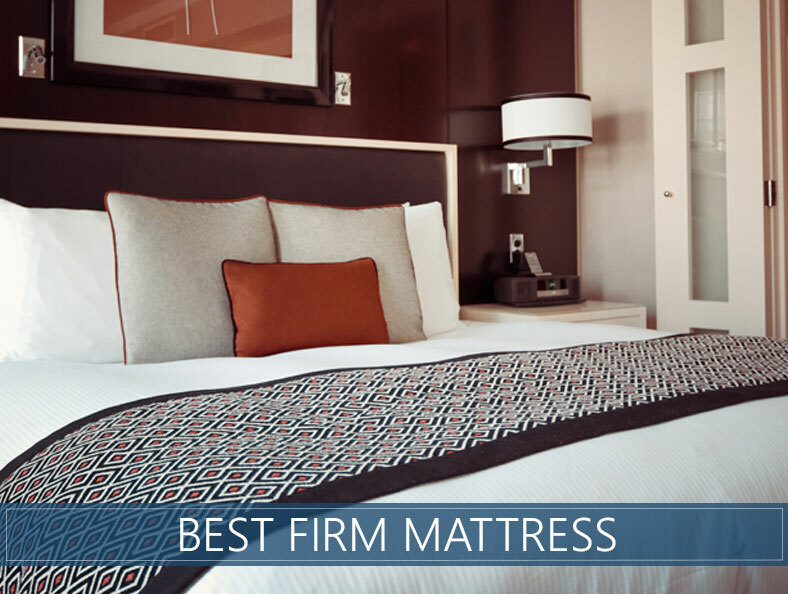 There are quite a few things that you would have to account for to understand what makes a great firm (or extra-firm) mattress. That’s why we’ve taken the liberty of providing you with everything you need to know in a structured and comprehensive manner. Hopefully, after you are done the reading, you’ll be confident choosing your ideal “hard” mattress. 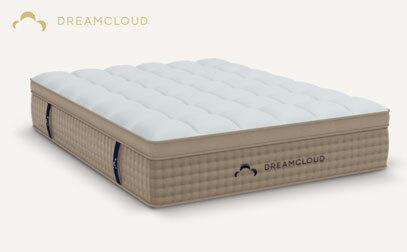 For consumers looking for slightly more support without feeling like they are sleeping on a rock, why not find it in the affordable luxury of DreamCloud? As a medium-firm offering in the online bed-in-a-box space, it yields comfortable contouring and support in a hybrid design. What stands out? To spend a night on DreamCloud is to experience luxury. It has embellishments such as tufting, cashmere, cooling gels, handles, and an extremely attractive look. The bed is a full 15 inches of comfortable foams matched with supportive zoned coils. Latex and coils add support while memory foam aids in pressure relief. It has a layer of high-density foam around the perimeter for stronger edges. If you are not 100% sure if you want a medium-firm option or something even harder, a major draw to DreamCloud is its 365-night trial. This extended amount of time will let your body adjust or you can take advantage of its “no questions asked” full refund. This bed offers a cloud-like experience, and we made a full review for those who are looking for a good hybrid. Check it out here. Firm memory foam? Although it may seem like a dream, especially to stomach and back sleepers, the Firm model from Loom & Leaf is an incredibly supportive memory solution. It has the perks of a luxury mattress (which it is, without the price) crossed with the needs of people who want a firmer feel. The memory foam and quilted organic cotton cover give it some comfort while the overall construction of the layers deliver exactly what you need. 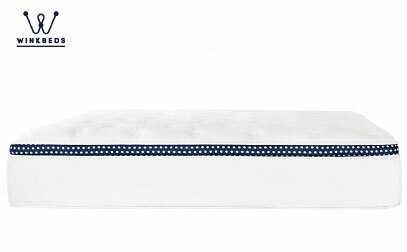 There is a cooling Spinal Zone Gel pad in the center third of the mattress, which provides temperature regulation and extra support for the spine. This is especially nice when lying in a position that has a lot of surface area contact with the bed. What stands out? 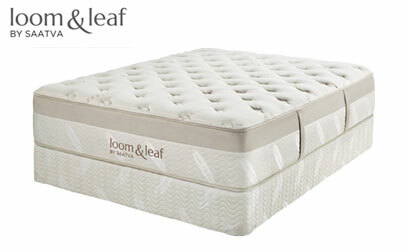 For a good firm memory foam solution, it is hard to beat Loom & Leaf. It is an exceptionally well-made product that feels truly high-end. Should you decide to purchase, you will be treated to the brand’s complimentary White Glove Delivery and mattress removal services! Check out our review of this high-end bed if you're interested in purchasing and you want to see more details. People who value durability should love the WinkBed. The brand has multiple models, and their Firmer option is the version we are focusing on for this guide. Those who love sleeping on top of the bed instead of inside it can appreciate its feel as well. Another great feature is its zoned coil system that has more support across the middle of the body and in the lumbar area. The sturdy coils make it a fantastic option for back sleepers, or those who favor the stomach and worry about sagging that can bow the spine. The WinkBed adequately addresses these alignment issues. Additionally, its strength makes it a favorable option for slightly heavier individuals who worry about sinking too much (although there is also a Plus model for those over 300 pounds). Why is it special? WinkBeds has been tested by a third-party and is shown to be a durable brand and not something thin that will wear down completely over time. From zoned coils to quality stitching, long-lasting layers, and even superior edge reinforcement, it is a solid product that is made to last for years to come. Learn more about the construction and build quality in our full review. Are you not sure if a harder mattress is right for you, but suspect that it might be? Purchase Zenhaven and flip it over at will – it is dual-sided. The brand claims that its Gentle Firm side feels 18% firmer than its Luxury Plush side. 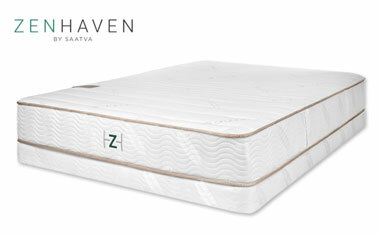 Zenhaven has four layers of tree-tapped American-made Talalay latex, bundled in organic New Zealand wool and cotton. The Talalay process for producing latex ensures a durable and consistent material that is also hypoallergenic. The brand has taken their production one step further by innovating the Talalay design to include five zones for even more support for the shoulder and torso areas. What makes it unique? Zenhaven has a luxurious latex feel, giving the body a buoyant feel when lying down, along with solid support and quick responsiveness in each layer. Its natural materials are hypoallergenic, so you can rest easy. Complimentary White Glove Delivery and free mattress removal are part of the Zenhaven package, making your best night’s sleep even more hassle-free. Check out Zenhaven review that we made here if you want to see if this is the best choice for you. 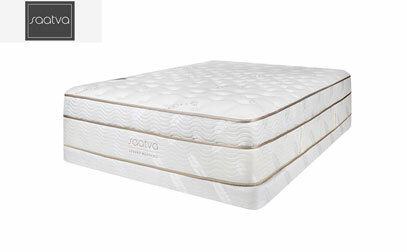 Saatva’s Firm model is an especially supportive innerspring bed that features a coil-on-coil construction with firmer foams in its comfort layers. Sleepers should feel like they are floating on top of the mattress rather than sinking into it and the alignment is great for most back and stomach sleepers. The coil-on-coil design includes individually wrapped springs on top of an interconnected coil base. While the first layer of coils helps contour, the base helps prevent sagging and gives support. The steel in the base coils has been tempered, which increases their durability. Why is it special? A firmer innerspring experience provides all the things people love about coils. From bounce to support, Saatva has it all in an exceptionally high-quality package. It has more premium features, like an enhancement to the lumbar area, as well as a dual perimeter edge support, and the incorporation of organic cotton into its cover. In addition, Saatva is a brand that offers free White Glove Delivery and mattress removal. Looking for more information? Check out our full analysis of The Saatva Bed here. Looking for a brand that is as good on your body as it is on the environment? Avocado could be the eco-friendly hybrid you’ve been waiting for. It can be ordered with an additional latex pillow top, which still has some firmness to it, or without for increased firmness. What makes it unique? From its natural Dunlop latex to upcycled coils, this brand has consciously chosen its materials to create a safer, greener slumber. There is no need to worry about off-gassing and the GREENGUARD Gold certification speaks to the company’s commitment to meeting some of the industry’s strictest standards. The cover is made with organic cotton, with a layer of New Zealand wool underneath that serves as a fire barrier and helps wick away moisture. The bed is highly responsive and the support really aids in spine alignment for back and stomach sleepers. One more thing we love is that Avocado donates a percentage of revenue to nonprofits focused on the environment. 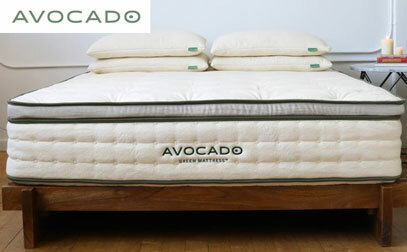 If you're interested in Avocado Bed, you should check out our full bed analysis that we made here. When exploring Helix’s personalized approach to the mattress, where individual customization is king, sleepers will fill out a short Sleep Quiz. It covers items that help determine point elasticity, support, and overall feel. 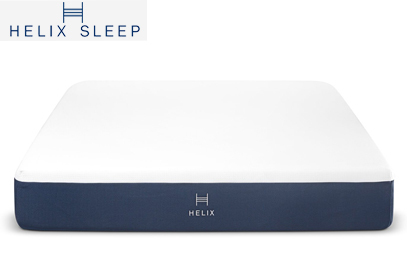 If you prefer a firmer bed, the company offers two choices: The Helix Twilight or Helix Dawn. One is built especially for side sleepers, while the other is built to accommodate all sleep positions. What stands out? Very few companies offer the level of customization of Helix. In just a few clicks, you can specify your optimal feel and needs, and the company will use their knowledge of springs and foams to select your bed. The brand uses micro coils, a proprietary Helix Dynamic foam, in some models memory foam, as well as a high-grade polyfoam, to create their innovative product. Depending on the scores on the quiz, they will choose a blend that should be perfect for you. Want to customize your bed as much as possible? Then you need to see how Helix is manufactured in our full review here. Nest Bedding® has built their entry-level Love & Sleep with many higher-level features. Their multiple comfort levels include a Firm mattress that works well for exclusive stomach sleepers and back sleepers who like a little extra support. 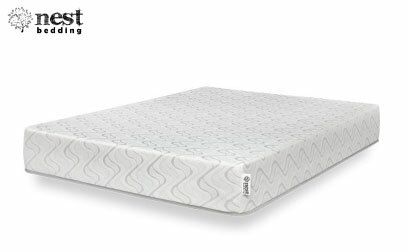 This iteration of the Love & Sleep has a supportive 8-inch foam core that is topped with a 2-inch layer of Energex foam that provides pressure relief and contouring. The entire bed is wrapped in a durable cover integrated with phase-change materials to help keep your temperature regulated. What stands out? The company has included some impressive cooling technology and a generous sleep trial/warranty package in their $599 price for a Queen-sized bed, a fantastic value in the entry-level space. There is also a Lifetime Comfort Guarantee that helps ensure your satisfaction for as long as you own the bed. This policy that allows you to switch out your bed for a new model, comfort level, or size for free in the first 100 days. After that, you can make an exchange for half of the current retail price. One of the first things that you want to consider is what kind of sleepers benefit the most from a good firm option. If you usually sleep on your back or your stomach – you may fall into that category. At the same time, if you are a heavier regarding weight, you’d also likely benefit a lot from a hard mattress that is more stiff than what a side sleeper needs. For those of you who like to sleep on their backs – the harder bed will work at keeping your spine in proper alignment, and it should prevent excessive sagging and contouring. Stomach sleepers, on the other hand, also benefit from a hard mattress for reasons that are quite similar. They tend to keep a particularly flat profile, which results in fewer gaps between your body and the bed. With this said, if you prefer belly sleeping, you should consider a unit that will prevent your back from arching. At the same time, the bed should prevent your pelvis from sinking right into it. Naturally, some people wouldn't prefer a particularly hard bed. Those of you who like sleeping on their sides probably wouldn’t appreciate the extra firmness. The reasons are numerous. Right off the bat, the very first thing that you should consider is that while sleeping on your side, you exert a lot more pressure on a concentrated surface on the mattress. That’s why the sinkage can be a lot more. If the bed doesn’t contour your body and sink appropriately, you can start experiencing pain in your shoulders and lower back. People who are light regarding weight should also stay away from hard beds. The reason is quite simple – they wouldn’t be able to exert enough pressure on the bed to sink and would likely float on top of it. This is a rather unpleasant sensation that can also cause a lot of issues. Obviously, firm mattresses are suitable for a particular types of sleepers. There are numerous benefits brought by a firmer bed, so let’s have a look. The truth is that you can never have too much support. However, the opposite is true. Firmer mattresses offer an expressed amount of support, and they are a lot more comfortable if used by the right person. Those of you who experience lower back pain, neck or joint issues could benefit. You would never be able to get a proper rest if your mattress is overly soft or if it’s sagging for the positions we've discussed. With this in mind, a proper bed with the necessary amount of firmness will comprehensively align your spine, inducing a state of great relaxation. If there is one thing that you should consider when picking a mattress, that’s the spine alignment. A firm bed can significantly help with this if used for the proper positions. A firm model offers splendid overall weight distribution which can alleviate a lot of pressure points between the body and the bed. As you have started your search online, there are a few guidelines you can use to help find something you will be comfortable on for years to come. While some people like to go to shops like Mattress Firm or other local stores, if you prefer to shop online, reference the following tips to help make your selection. Obviously, there are different types of firmness levels when it comes to it. We’ve decided to focus on those who score up the higher end of the scale. Typically, for a mattress to be above the average, it has to be medium firm, firm, and extra firm. These all have different purposes. For instance, medium-firm beds are preferred by the vast majority of sleepers. It’s estimated that about 80% of people prefer this particular firmness level. Firm ones would feel slightly less tough in comparison, and the firmest ones are very sturdy. Hard mattresses are great for back and stomach sleepers while extra-firm ones can be used by people who are substantially overweight or are just very heavy. This would help guarantee the necessary support. There are different types of materials that you can go for. The most preferred on the market when it comes to beds are memory foam, innerspring and latex. Now, if you are a fan of memory foam mattresses, you could have a harder time finding a firm, let alone extra firm bed. This is due to the natural properties of the material. On the other hand, innerspring and latex are materials are generally more responsive, and they can make it easier for the mattress to be a firm. They are the predominant materials for most extra-firm solutions just for that reason. Sagging in mattresses that are firmer could be a serious issue for sleepers. In certain situations, the excessive sag is caused by the low quality of the material. That’s why we recommend making no compromises if you’re to buy a firm bed. Old mattresses, however, may no longer have the material or structural integrity to deliver the necessary amount of support. Keep in mind that the average useful lifespan for the majority of beds will range between 8 and ten years. Of course, there are a lot of factors that might affect and alter this such as usage, body type, weight, and others of the kind. The edge support is quite important for some, and it’s amongst the factors that you can account for. Poor edge support could potentially lead to quicker sagging of your mattress as you sleep regularly on it. For those sleepers who share it with someone else, you are likely to find yourself on edge a lot more than you’d like to. This is when you can definitely appreciate proper edge support. However, another way to help get around it is to get a bigger size if you are part of a couple. For instance, instead of getting a Queen size, you can order a King size so there is more available space for each person. Amorous activities are also an important consideration. Interestingly enough, quite a lot of couples enjoy taking advantage of the edge of the bed for sexual activities. Most of the options outlined above do not suffer from this problem. This is one of the most commonly underestimated characteristics and also one of the most important ones for many people. The air flow that your mattresses allow largely determines the overall temperature of the unit. The last thing you’d want is to wake up sweating through the night, just because you’ve picked a unit that retains a substantial amount of heat. You can aim for something cooler and innerspring and latex are the leaders in this segment, though there are often gel infusions in memory products. Overall, a cooler bed is attributed to better sleep and proper rest. 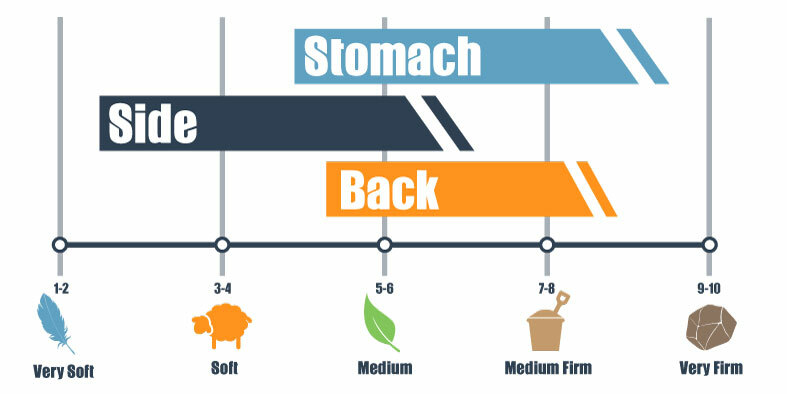 As you can see for yourself, there are quite a lot of factors that you should account for when purchasing a firm mattress. More often than not, people that fail to consider something important could result in regret later on. Your mattress is one of the most critical requirements for a good night’s sleep. Make sure that you’re well-aware of the specifications so that you can conveniently take an informed and adequate decision based on your sleeping patterns, preferences, and requirements. These are still not hard compared to proper hard bedding setups, such as an authentic futon. Such setups are generally vastly superior to any “mattress” created in the “developed” Western world, and have been used successfully by the Eastern world for many thousands of years. The spine gets in proper alignment thanks to a hard surface.